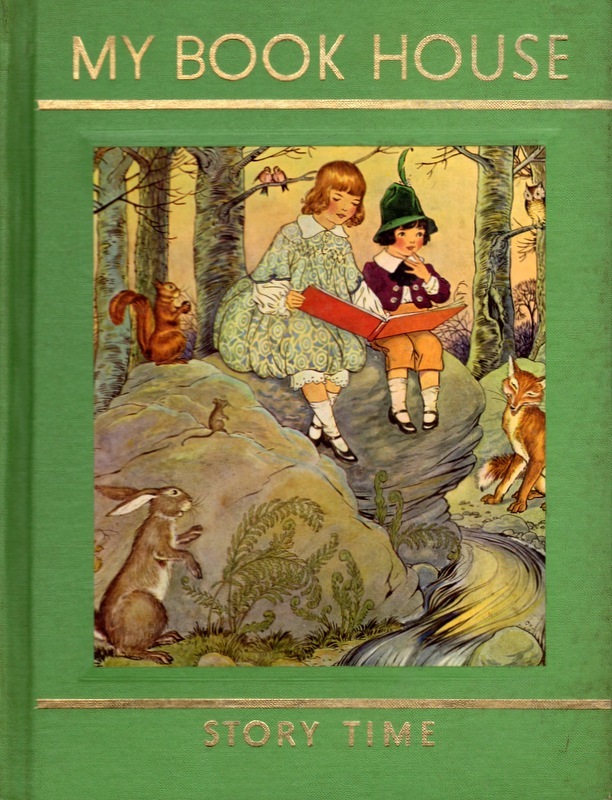 My Book House, edited by Olive Beaupré Miller: a treasure trove of children’s literature. In the “About Me” section of this blog I mention how much I loved this series growing up. This may surprise readers, considering I obviously read and love books now, but there were not a lot of books in my home growing up, and I was not much of a reader. Loving to read didn’t really come until I was an adult. 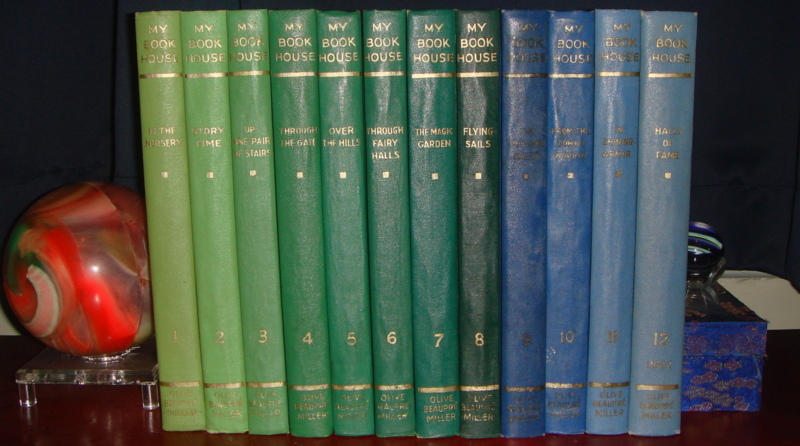 However, my family did have a complete set of the My Book House books and I loved them. In fact, we all loved them. Olive Beaupré Miller was a fascinating woman and ahead of her time. Though there’s not a lot of material written about her, this biographical note contains some amazing highlights. A graduate of Smith College, she began writing rhymes and stories to entertain her young daughter (in addition to editing My Book House Miller also wrote many of the entries). 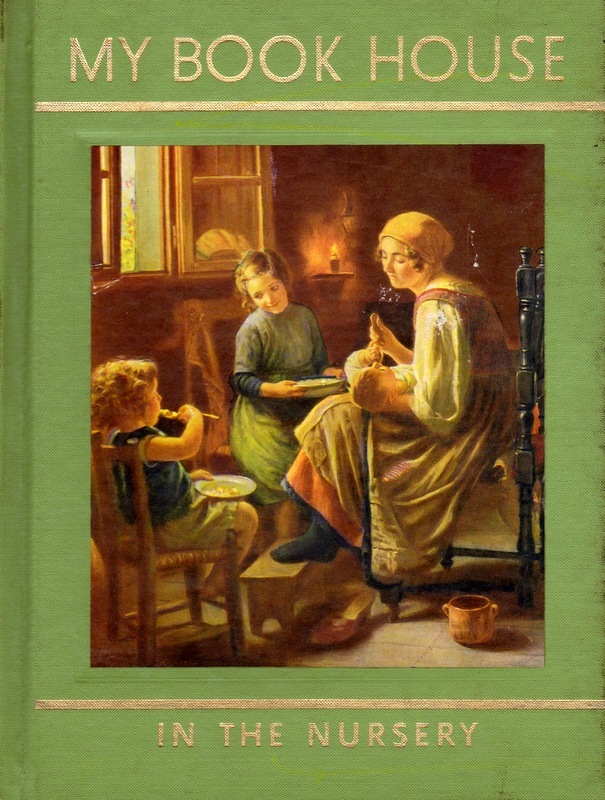 After publishing three books, she founded The Book House for Children publishing company with her husband in 1919; in 1920 the first volume of My Book House (titled In the Nursery) was published. “First, — To be well equipped for life, to have ideas and the ability to express them, the child needs a broad background of familiarity with the best in literature. Second, — His stories and rhymes must be selected with care that he may absorb no distorted view of life and its actual values, but may grow up to be mentally clear about values and emotionally impelled to seek what is truly desirable and worthwhile in human living. And these books still fulfill that mission today. While some stories are admittedly dated—at the very least, some characters of color should be included in the art—most of the material is still worthy of attention and much of the material is still important to current American and European culture. The first set of My Book House books consisted of six black, cloth-covered books that were published between 1920 and 1922. Later the black cloth was changed to green and three storybooks were added—Tales Told in Holland, Little Pictures of Japan, and Nursery Friends from France. Occasionally these sets can be found inside a custom wooden house that was created for promotional purposes in the mid-1930s. We had one such set for sale while I was working at Books of Wonder and it was beautiful. Around 1930 the six-volume set was expanded to twelve. 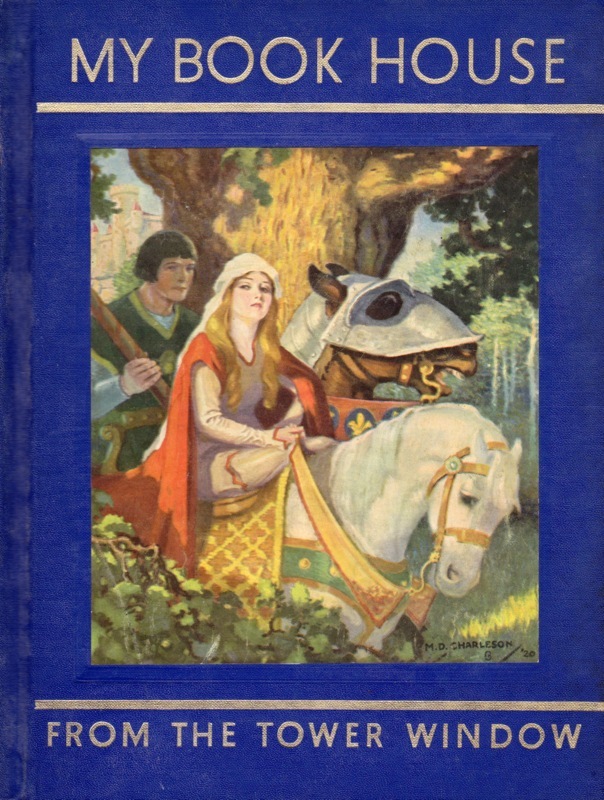 The content was mostly unchanged (some tales from the three storybooks were incorporated) and the concept remained the same: the books were meant to “grow” with the children with early volumes containing nursery rhymes and simple stories and later volumes containing Chaucer and Shakespeare. There were updated versions in 1937 and again in 1971 (in later printings at least two stories, Little Black Sambo and The Tar Baby, were replaced with less racist material). The whole set went out of print in the early 70s. There were different cover designs over the years; the set that I grew up with—which my mother purchased from a door-to-door salesman—consisted of twelve books and was printed in the 1950s. The first book in the series was covered in light green cloth, the last in light blue; the color of the books in between ranged between the two hues, like a rainbow of greens & blues. 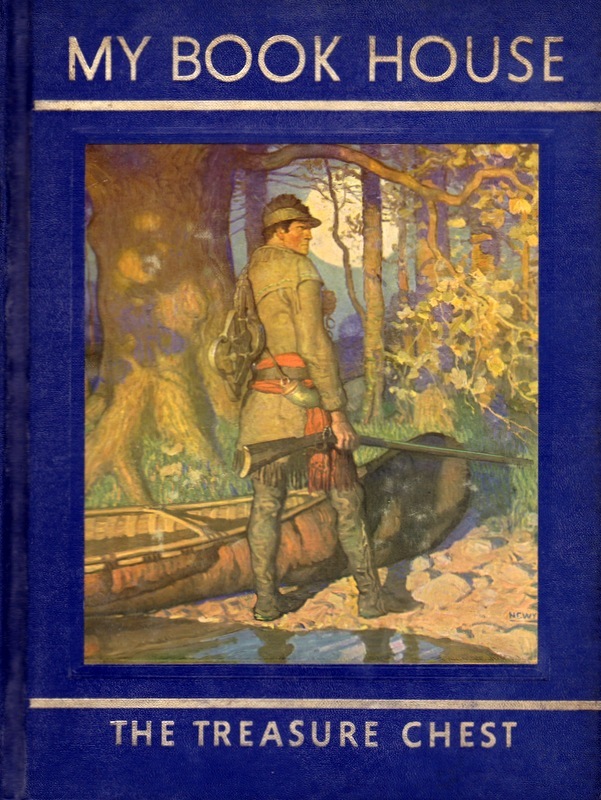 Each volume had a gorgeously illustrated color-plate affixed to the front cover; Volume 9’s cover art is by N. C. Wyeth. 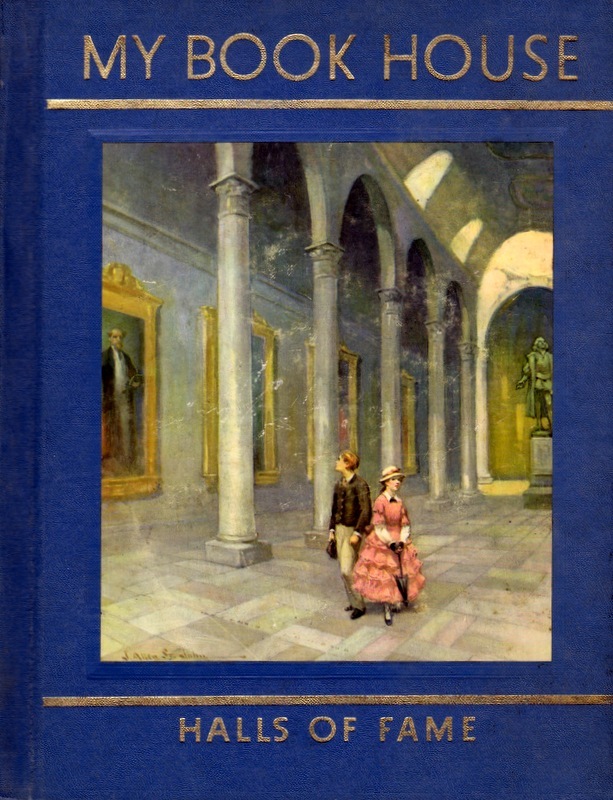 All twelve volumes are beautifully illustrated throughout with color and black and white art. The wide variety of artists includes Milo Winter (famous for his art in Aesop’s Fables for Children), Maud and Miska Petersham (1946 Caldecott Medal winners), Palmer Cox (creator of The Brownies), Johnny Gruelle (creator of Raggedy Anne and Andy), Garth Williams (illustrator of many books including Charlotte’s Web), W.W. Denslow (illustrator of The Wonderful Wizard of Oz) and many other important and recognizable names. The highly varied literary material is of the highest caliber. Authors include Rudyard Kipling (author of The Jungle Book), Louisa May Alcott (author of Little Women), the English poets Robert Browning, William Wordsworth and William Blake, Lewis Carroll (author of Alice’s Adventures in Wonderland), Robert Lewis Stevenson (author of Treasure Island), and countless others. 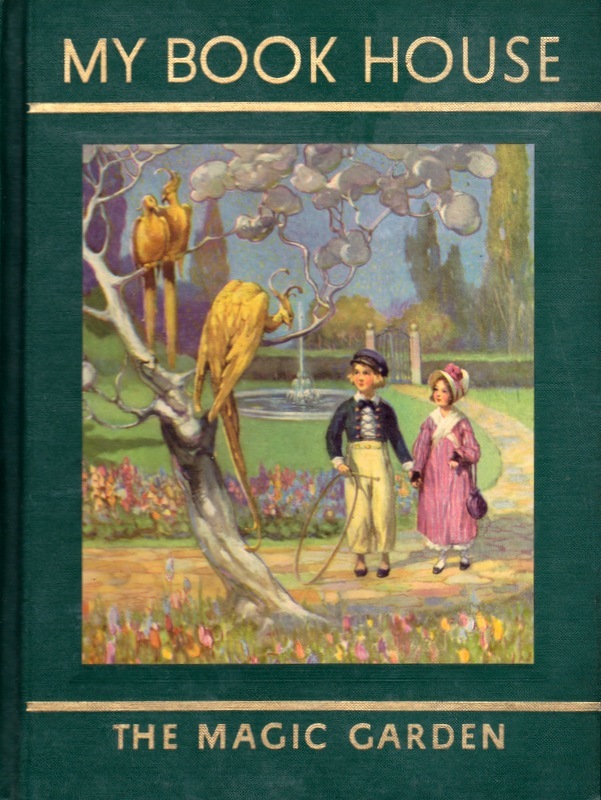 Volume 1, In the Nursery, is heavily illustrated with art on every page and begins with Mother Goose and English nursery rhymes. It moves on to poems and rhymes from around the world, and ends with what are referred to as “experience stories,” which are basically simple tales of everyday life. For instance, a story titled “What the Children Do in Summer” by Pearl S. Buck, outlines how five different children like to spend their summer days. Volume 2, Story Time, is also heavily illustrated but slightly less so than Volume 1; this volume tends to have only one or two pieces of art per page. It begins with short, repetitive and rhythmic stories and moves onto slightly longer, and highly recognizable stories such as Beatrix Potter’s “A Tale of Peter Rabbit,” Hans Christian Andersen’s “The Ugly Duckling” and Fables by Aesop. It was this volume that contained “Little Black Sambo,” (the stand-alone book is actually titled The Story of Little Black Sambo) which was later replaced; the set I own contains this story. Interestingly, the illustrations feature distinctly Indian characters as opposed to Bannerman’s own art featured in the stand-alone book, which was stereotypical of the time, and racist. Volume 3, Up One Pair of Stairs, introduces readers to simple fairy tales, more complex poetry and ends with an excerpt from Charles Kingsley’s “Water Babies.” I remember this last story making a strong impression on me as a child and I read it again and again. 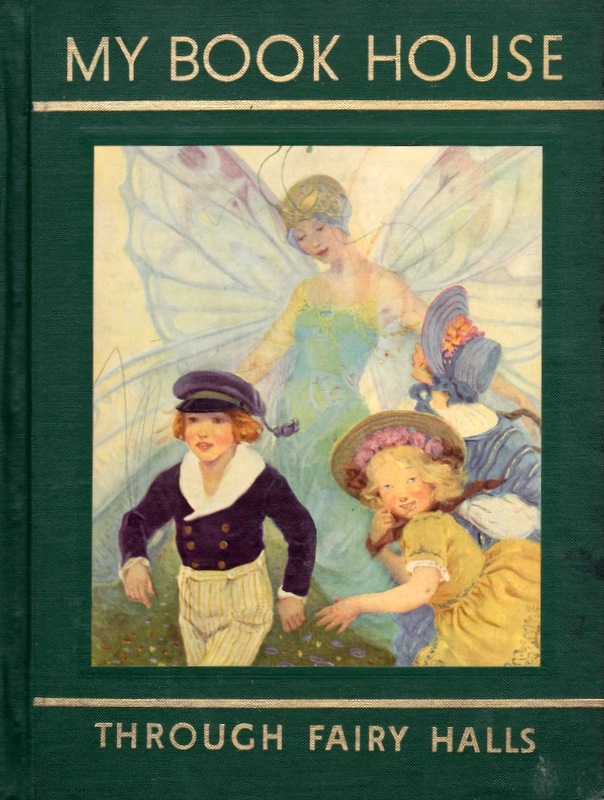 This volume is also heavily illustrated and we begin to see art by some of the most influential illustrators for children: Kate Greenaway, Randolph Caldecott and Walter Crane. 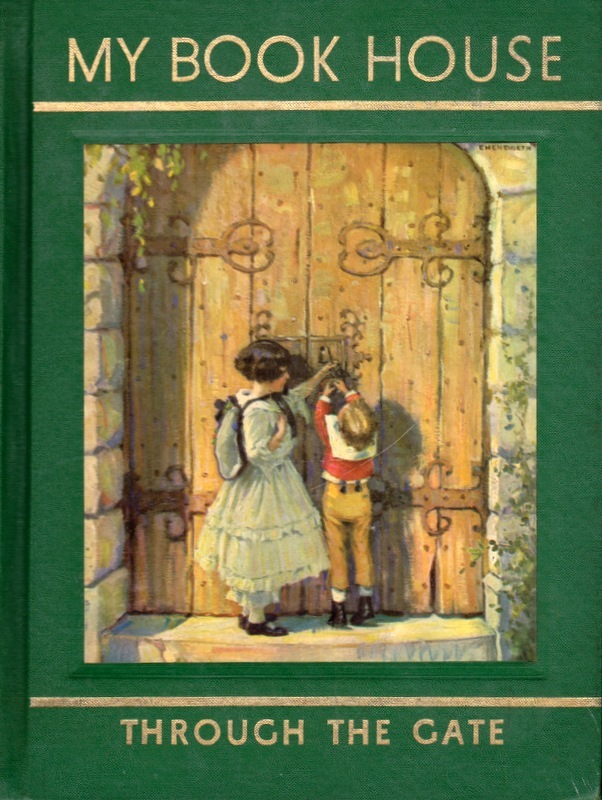 Volume 4, Through the Gate, contains more fairy tales, including “Cinderella” and “Snow White and Rose Red,” and popular American folktales, such as “Pecos Bill” and “Old Johnny Appleseed.” This volume is still heavily illustrated but the art becomes sparser, befitting of material for this age group, with occasional spreads featuring only text. 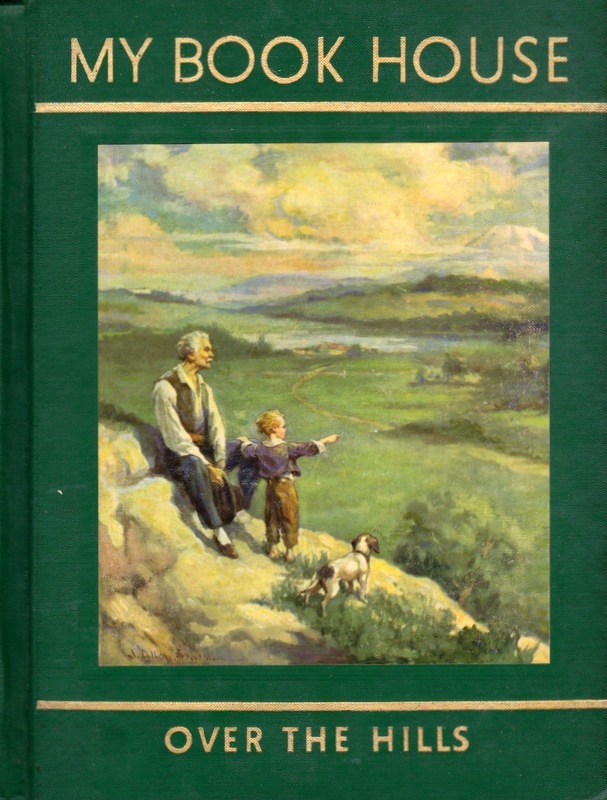 Volume 5, Over The Hills, continues with folktales but also includes stories of important inventions (for example, the use of steam in trains and boats) and highlights of American history and historical figures, as well as excerpts from “Charlotte’s Web” by E.B. White and “Winnie-the-Pooh” by A.A. Milne. One of the most interesting entries may be “The Fairyland of Science,” which is a story of Jean-Henri Fabre whom is considered to be the father of modern entomology. 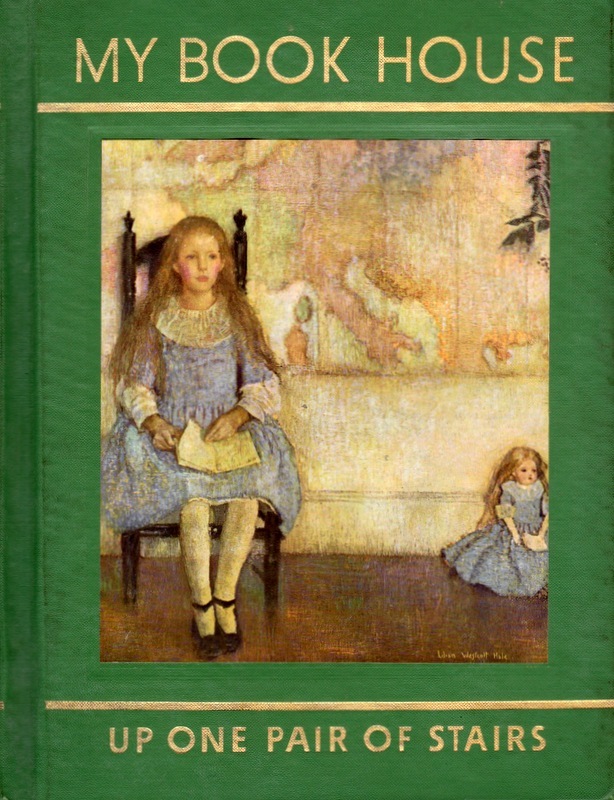 Volume 7, The Magic Garden, contains more complex folktales and fairy tales and includes the first known “Cinderella” story, an Egyptian tale titled “Rhodopis and Her Gilded Sandals.” As discussed in my review of Fairy Tales from the Brothers Grimm: A New English Version, every culture has its own collection of tales passed from generation to generation and many tales have sister stories in other cultures—Cinderella is one such story. This book also includes a poem by Edgar Allen Poe, and excerpts of works by William Shakespeare and Nathaniel Hawthorne. By this volume art appears every few pages; this frequency of illustrations remains the same through the rest of the series. 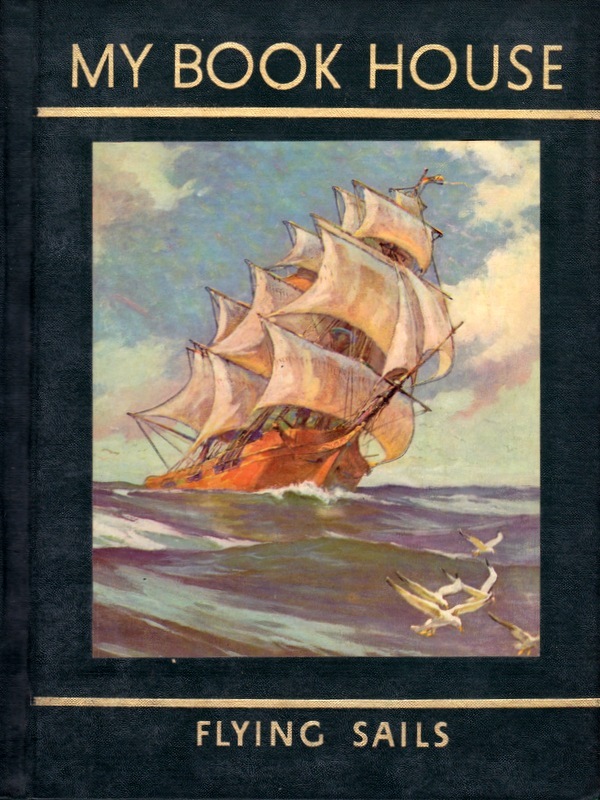 Volume 8, Flying Sails, turns from fairy tales to stories of adventure, both real—“The Adventures of General Tom Thumb” by Phineas T. Barnham, and imagined—“Gulliver’s Travels to Lilliput” by Jonathan Swift. Volume 9, The Treasure Chest, is more of the same kind of stories that appeared in Volume 8. Among other true stories in this book, we have “Exploring the Wilderness,” the story of Daniel Boone and “The Adventures of Alexander Selkirk,” the shipwrecked sailor whose story inspired Daniel Dafoe’s Robinson Crusoe. Included with other fictional stories are two Greek myths, two Norse myths, a story from the bible and “Hiawatha’s Fasting” by Henry Wadsworth Longfellow. 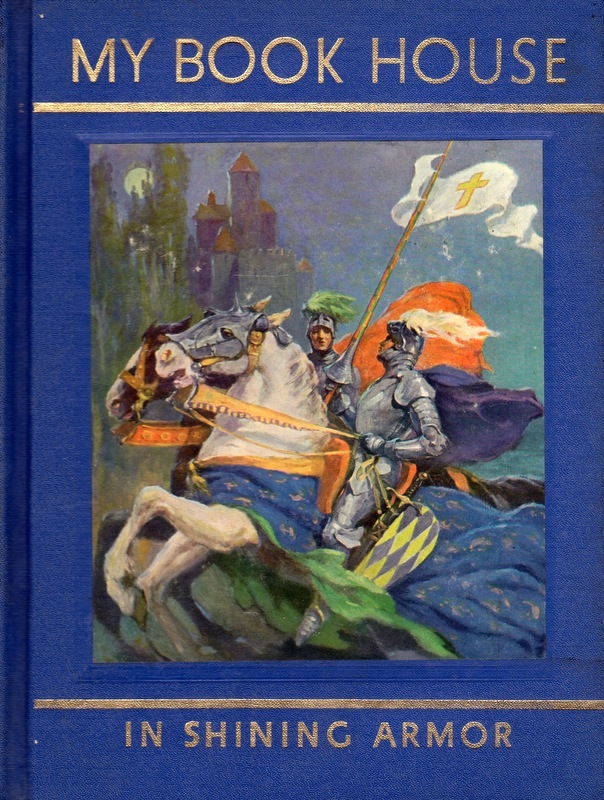 Volume 10, From the Tower Window, is comprised of heroic and romantic adventures taken from Russian, French, Spanish or Roman epics, as well as stories about Joan of Arc, Robert Bruce, and The Children’s Crusade. And I must say, Ms. Miller could not have been more right, for, while books did not surround me as a child, I had this gold mine at my fingertips. Long after I had “outgrown” the series I would still return to it to peruse the art or reread favorite stories. Having looked carefully through each volume while writing this post I realized how much of my literary knowledge (prior to my bookstore years) came from these twelve volumes. My Book House laid the foundation for what eventually became my passion for books and my love of reading. Find used copies on Amazon.